> What do you have to consider before buying a CO2 incubator? 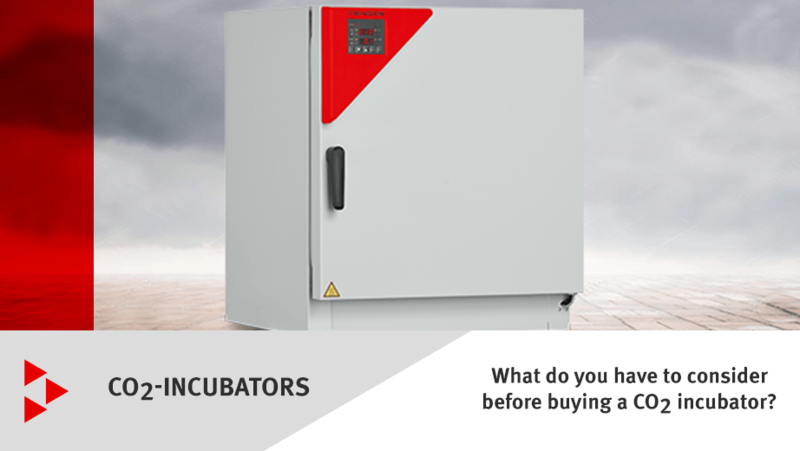 Which factors feed into the decision-making process when purchasing a new CO2 incubator? This article tells you about important criteria which you absolutely must bear in mind when buying a new CO2 incubator. Before you get a new CO2 incubator for your laboratory, you should find out about the most important quality characteristics in relation to them. Here we will show you what factors are at play when making a purchase and what criteria it is best to base your decision on. The most important thing when growing cell cultures is obviously the cleanliness of the environment and protection against contamination. But the question of whether this cleanliness can be guaranteed in the long term is important too – the most crucial factor here is the design of the CO2 incubator’s interior. How easily and effectively can the unit be handled and cleaned? The interior design also affects which applications will be possible, so this aspect must be thoroughly researched in advance. A humidity management system protects your cultures from drying out, while a CO2 gas supply ensures that an optimum pH value is achieved in the cell medium. Make it a priority when buying your CO2 incubator to check that these essential functions are provided. Of course, you also have to give some thought to the cost-benefit ratio when purchasing laboratory equipment. Think of your CO2 incubator as a long-term purchase and consider the costs you will incur for maintaining the unit. Bear in mind potential contamination risks even before making a purchase! According to a study by health economist Prof. Dietmar W. Hutmacher, an average in vitro experiment with cell cultures costs around €9,000. If contamination occurs, however, the experiment is completely useless and ends up costing more than it would to buy a new unit. So what are the weak points you should look out for when making a purchase? Above all, it is interior fans and fixtures of any kind which provide colonization surfaces. Less is more – so the ideal interior should have as few fixtures as possible. The simpler the design of a CO2 incubator, the faster and easier it is to disinfect by spraying and wiping. Good units also offer a hot air sterilization option as standard. The creation of cell cultures is a complex and sophisticated process that demands great concentration, so the laboratory equipment used should not make the work any more difficult unnecessarily. The components of your CO2 incubator should be easy to install and remove, since this process step is essential after every experiment. The time needed for such tasks varies greatly and can quickly add up if installation is a laborious process. The standard temperature range when performing hot air sterilization on an interior is 160 to 180 degrees Celsius. Ideally, this can be controlled easily at the touch of a button. To enable you to evaluate and share your measurement data directly, the CO2 incubator should feature Ethernet interfaces. What is the best way to stop cell cultures from drying out? The answer is an effective humidification system that guarantees consistently high humidity levels in the atmosphere in the interior. This is achieved by placing a water pan inside, which should be easy to remove, provide a high relative humidity (RH) of between 90 and 95%, and guarantee a short humidity recovery time. Humidity management as a key factor: In practice, it is impossible to avoid the door being opened during the observation period. What is more important is that the cells are not damaged in any way in the process. What are the options for homogeneous atmospheric mixing? The latter is certainly not to be recommended, since there will inevitably be places where contamination could be hidden and airborne germs will definitely spread! This would result in a potential source of contamination. The measuring method is a significant factor too. The CO2 sensor can be located both inside and outside the incubation chamber. An external CO2 sensor is more complex and susceptible to faults. By contrast, a CO2 sensor in the interior of the CO2 incubator is more precise – since it takes measurements in the incubation chamber direct. An inside sensor must be able to withstand the temperatures reached during hot air sterilization – but good products will already be able to do this. Alternatively, it is possible and acceptable to use plug-in sensors. The motto “less is more” really does apply to the interior design of a CO2 incubator. The fewer corners, angles, shafts or screws the better when it comes to preventing contamination. Smooth interior walls, ideally made of stainless steel, are a must so the surfaces can be hygienically cleaned. But “less” does not mean you should just end up with fixed racks – you should be able to decide for yourself how many shelves you want and what heights they will be at. Cast a critical eye over the external appearance too: Is the CO2 incubator built such that two units can be easily and securely stacked, then operated conveniently? Bear in mind the running costs of your CO2 incubator! It is unavoidable that maintenance and cleaning costs will be incurred when operating a CO2 incubator. The running costs relate to consumables and wear parts, as well as cleaning agents and, of course, staff. It can take between one and five hours to clean a CO2 incubator properly. The smarter the design, the shorter the working time and, consequently, the less material is used. Definitely give some thought to these factors before making your decision. Do not just go for the cheapest model when buying your CO2 incubator, because just a single failed experiment can cost many times more than the purchase price. Much better to hold to the standards and requirements that apply in your field of research and think over the factors described here when making your purchase. Does the unit have a clever design, which is easy to use and maintain? Does it feature an optimum humidity management system and a well-thought-out method of gas supply? Is it cost-effective and low-maintenance to run? To ensure you make the best decision for your project, we have summarized the most important aspects in our guide titled “Six points you need to consider when buying CO2 incubators.” Download the guide free of charge and use it as an aid in making an objective decision!